Biking in Amsterdam is a quintessentially Dutch experience, and it's by far the most popular and most efficient way of getting around. But Amsterdam's frenzied flow of traffic and confusing streets can intimidate visitors on two wheels. Read these tips for keeping yourself and your bike safe before you hop on your cruiser. Amsterdam's 400 km (249 miles) of bike lanes and paths (​fietspaden) make city cycling safe. They usually run along the right sides of streets. Some two-way lanes are on one side only. They typically feature white lines and bike symbols painted on the road or on the reddish-colored path. Amsterdam traffic uses the right side of the road, and this includes bikes. Many streets in the historic center and along canals don't have bike lanes at all. Just ride with traffic here, or stay to the right to let motorists pass. Large cars and trucks will usually follow behind you. Bike traffic lights: These lights shine red, yellow and green in the shape of a bicycle at most major intersections. Obey them. Trams and other traffic have their own lights that don't always correspond. Use the traffic light meant for cars when a bike light doesn't exist. Designated Bike Path/Route: This is a round sign with a blue background and a white bicycle. It indicates a bike lane or route. Bikes/Scooters Excepted: A sign with the word uitgezonderd ("except") and a bike/scooter symbol means that bikers are the exception to the otherwise posted traffic rule. For example, a round, red sign with a white dash means no entry. Bikers are allowed entry if the white, rectangular uitgezonderd sign is also present. Always give right of way to trams from any direction. Listen for the distinctive clanging of their bells. As for all other vehicles and bikes, give right of way to traffic approaching from the right. Traffic coming from your left should give you the right of way. Taxis and buses often push the limits on this rule, so err on the side of caution when they approach. Local Amsterdam bikers tend to ignore red lights. They tote friends on the backs of their bikes. They ride on the sidewalks. They zip past fellow bikers without warning. They don't use lights at night, which is required by law. They chat on phones while weaving through crowds. They're not to be mimicked! Use hand signals when you're changing course. Just point in the direction you want to go. This will let motorists and other bikers know to yield or not to pass you on that side. When in doubt at intersections, dismount. There's nothing wrong with getting off the bike and walking it through busy areas. Steer clear of tram tracks -- they're just the right size to swallow bike tires. If you must cross the tracks, and you will at some point, do it at a sharp angle. Many suggested bike routes are tram-free. You may know the road rules, but that doesn't mean everyone does. The most abundant obstacles you'll encounter on a bike are pedestrian tourists. They unknowingly walk in bike lanes and cross streets without looking. Watch for them and use your bell to get their attention. Much to my dismay, scooters are always in and out of the bike lanes. They speed by, scaring the you-know-what out of cyclists. When you hear them coming with their piercingly loud exhaust systems, stay to the right and let them by. Never leave a bike unlocked, not even for a minute. Bike theft in Amsterdam is a problem, but it can be avoided. Lock your bike to a permanent structure like a bike rack, pole or bridge with a heavy chain or U-lock. Always put the lock through the frame and the front wheel. Also, lock the brilliant little device that immobilizes the back wheel. Most rental shops provide both. Look for signs that say Hier geen fietsen plaatsen -- "Do not place bicycles here." If you ignore them, your bike could be confiscated. Try to keep pace with fellow bikers. You may ride two abreast as long as your pace doesn't hold up traffic. Never come to a complete stop in the bike lane or on the street. When you're walking with your bike, do so on sidewalks or pedestrian areas. Not all Amsterdam streets are meant for cyclists, so "winging it" without a route plan can be inefficient and dangerous. Use a map. Most rental shops have basic city maps/routes, but these are a bit limited. Highly recommended is the Amsterdam op de fiets -- the "Amsterdam on the bike" map. 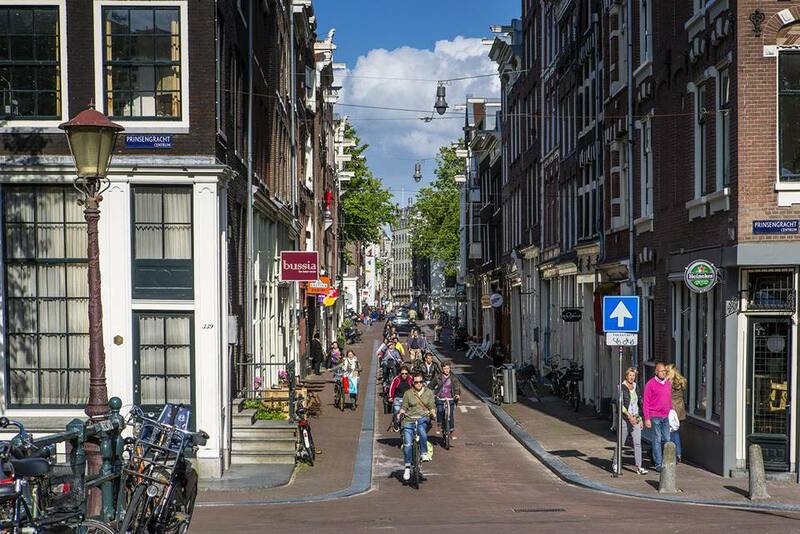 It's available at Amsterdam Tourist Offices and shows suggested bike routes, areas closed to cyclists, bike repair shops (important for flats), tram lines, and even museums and popular attractions. It covers all of Amsterdam from northern islands to southern suburbs.